Plugins for DraftSight enhance your experience with productivity features that are specifically designed for DraftSight, the popular CAD software from Dassault Systèmes – co-developed by Graebert. All plugins run as well on the free version of DraftSight and/or on the Professional and Enterprise versions. Languages and Operating Systems supported for each plugin may differ from one plugin to another. Please check in the plugin description for details and find a list of available plugins below. Every plugin ships with a self-explaining step-by-step Installation Routine that you can simply follow to install the plugin within DraftSight. This plugin is mostly designed for Electrical CAD related to product design and not the implantation of electrical systems in residential buildings. With more than 7000 components this software will help the users of DraftSight to design 2D electrical diagrams in DWG according to the latest DIN, IEC, ABNT and ANSI standards. It will also generate the bills of materials, from/to and terminals lists they need. 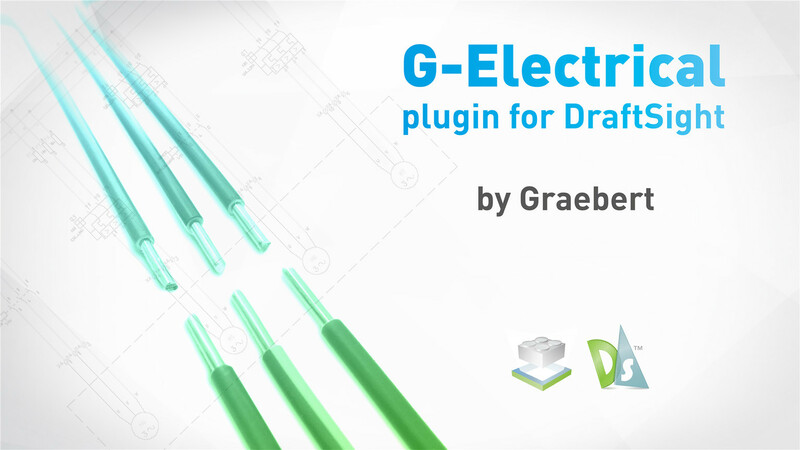 G-Electrical helps you to generate all the pages of your electrical CAD project with a maximum of 40 pages per project. Your project is saved in one single DWG file with all the pages created. How to try if you have the free version of DraftSight? This plugin requires features that are not available in the free version of DraftSight. If you like to try G-Electrical you need therefore to make sure first that you have DraftSight Professional or DraftSight Enterprise. For that purpose you may activate the free trial of DraftSight Professional. In the Free version you will find “Try DraftSight Professional” under the product Help menu or can enter the keyboard command _STARTTRIALDRAFTSIGHTPRO. The Annual license is a cost-effective solution to use the plugin for 12 months. Requires DraftSight Professional or Enterprise 2018 SP1 or higher. Update Information for Version 2019: Please uninstall any previous versions of G-Electrical via the Control Panel of Windows before installing version 2019 of this plugin. All G-Electrical 2018 licenses (unexpired) will stay valid for the 2019 version. The G-Electrical Workspace can be switched to to via the top right selection box as usual. Convert and import PDF files into entities you can modify in DraftSight and save in DWG or DXF. The Annual license activates this plugin for 12 months on one computer, whilst the Perpetual license activates this plugin on one computer without limitation of time. The PDF Import plugin allows you to insert all or selected pages from multiple page PDF documents within seconds. Converting large numbers of files to DXF is easy using the batch processing feature. Or convert vectors to drawing entities (lines, circles, ellipses, and splines) instantly. Converting large numbers of files to DXF is easy using the batch processing feature available with a valid active license. Note: The 30-day trial version does not include batch processing. DraftSight 2019 is not supported yet. The plugin version for Draftsight 2019 is under construction and will be available soon. Note: PDFImport for DraftSight requires DraftSight R1.3 or higher (Windows only). If this plugin stops working after an upgrade of DraftSight, you can download from this page the most recent setups. NB:In DraftSight 2016 the new ribbon interface moved the PDFImport feature to a menu located close to the help in the top-right corner of DraftSight. You may also call the feature by entering PDFIMPORT in the command line. OnlineMaps for DraftSight lets you browse and insert maps into drawings once you have registered your copy. The software is powered by ArcGIS Online from Esri. For more information on ArcGIS Online visit arcgis.com. 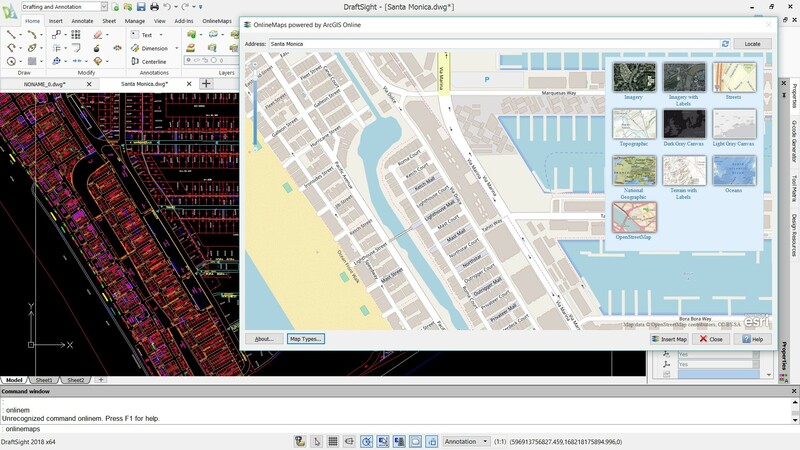 Note: OnlineMaps for DraftSight requires DraftSight R1.3 or higher (Windows only). If this plugin stops working after an upgrade of DraftSight, you can download from this page the most recent setups. NB: In DraftSight 2016 the new ribbon interface moved the OnlineMaps feature to a menu located close to the help in the top-right corner of DraftSight. You may also call the feature by entering ONLINEMAPS in the command line.